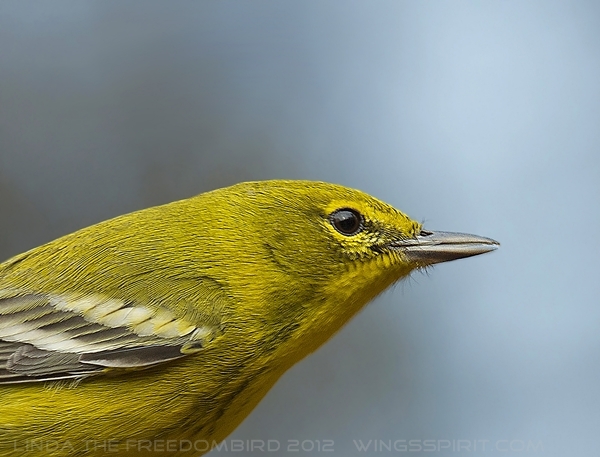 Among all the warblers migrating or passing through my yard, Pine Warblers (Dendroica pinus) are the only ones staying year round. They like to forage on top of pine trees for pine seeds. I often see them catch insects in the mid of the air. They come to suet or seed feeders more frequently during winter and they also like to search food on the ground. I have two pairs live in my backyard forest and they sing a sweet, musical trill (here their songs here). The easiest way to identify this warbler is their two white wing bars. Male, as seen in this post, has yellow throat, breast and belly with olive-green back. Female is duller and less streaking on sides of breast. I will update this post when I photograph a female. Excellent capture! I enjoy having these birds eat my bird cakes during the winter months.